If you aren't a sweets person, go ahead and skip this entire post. But if you are like me and have a massive sweet tooth, then read on. You will thank me. Bubble Tea lovers unite! At this specific Vivi Bubble Tea location, you will find typical spicy popcorn chicken bites, plenty of boba tea float options. 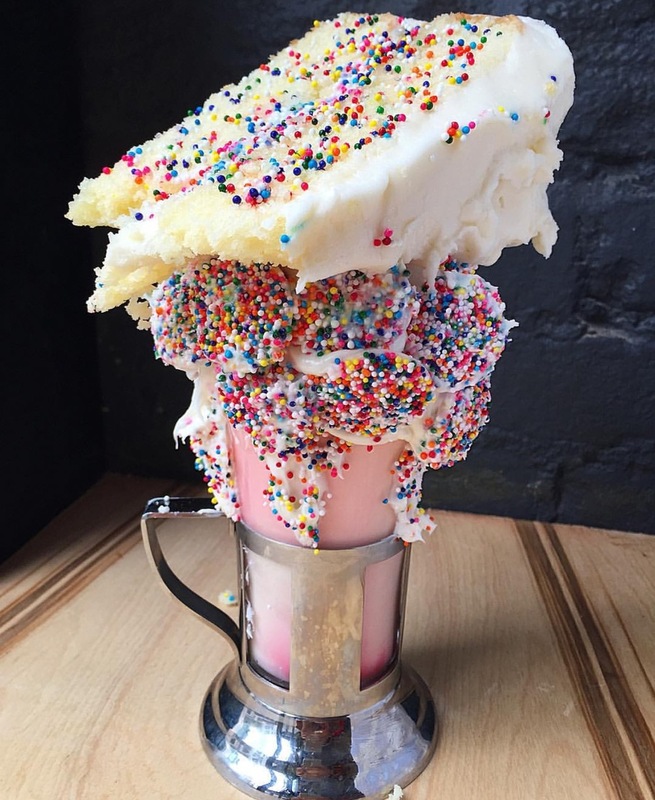 The floats consist of a tea of your choice and ice cream topped with cotton candy sprinkled with pop rocks. Talk about a party in your mouth! 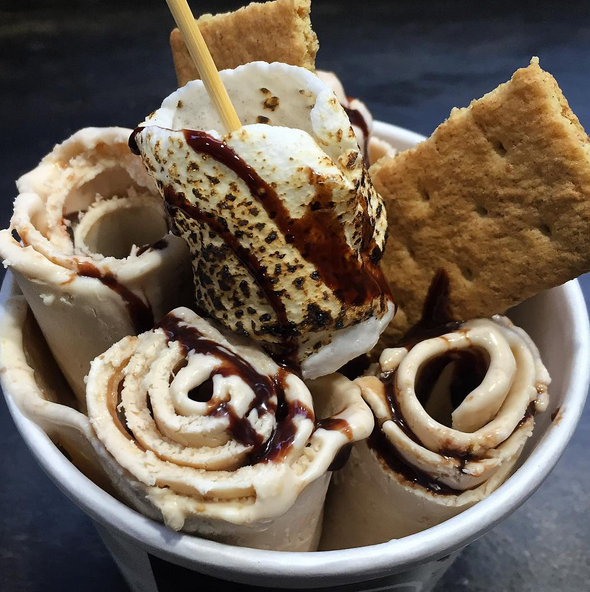 What the heck is rolled ice cream? At 10 Below, you are going to find out and not ever want to eat regular scooped ice cream again! I loved the Match Green Tea and frozen strawberries option and the Vietnamese Coffee pick; both were creamy and delicious. Note, if there isn't a line, 10 Below is a little tricky to find. YOu have to go down a set of stairs from the street to find it as it isn't on the street level. Randomly found this place when coming home from dinner one night and have loved it ever since. To top off the many random new ways desserts are being made, no need to reinvent the wheel. Doughnut= yum. Ice cream= delicious. Doughnut ice cream sandwich is heaven. Holey Cream cuts your choice of doughnut in half, puts 3 scoops of ice cream in the center and tops it off with sauce, and your choice of fruit, candy or cereal toppings. But eat it fast because you wouldn't want the doughnut to get soggy. Talk about a sugar rush! Who would have thought shaved ice would taste creamy and flavorful? Snow Days makes you wonder if you will ever go back to real ice cream! The shaved ice is really light and fluffy, and then in your mouth, melts into a flavorful smooth texture. I highly suggest trying the Yeti Tracks flavor, its cookies and cream. There are plenty of other flavors and then of course toppings; my favorite is the chocolate Pocky sticks! They have pre set combinations you can order from or you can go a la carte. Great treat if you are looking for something on the lighter side. Eggloo specializes in ice cream wrapped in Hong Kong egg waffles. The egg waffle itself is crunchy on the outside and fluffy on the inside, giving it great shape and a perfect texture for a waffle cone. Eggloo offer 3 types of waffle flavors and 3 types of ice cream; I really enjoyed the green tea egg waffle, vanilla ice cream and fruity pebbles toppings! Ice and Vice knows how to sell an experience. Flavor names and unusual ingredient combinations are common here and with names like "Opium Den", "Friggin' Toasted" "Tea Dance" and "Bath Salts", how can your imagination not run wild? I originally found this place because I fell in love with Squish Marshmallows and they had a partnerships with Ice and Vice, and I just had to go check it out. You must try Opium Den, its a combination of poppy seed, white sesame and lemon crouton. Sounds SO strange, but so very tasty! 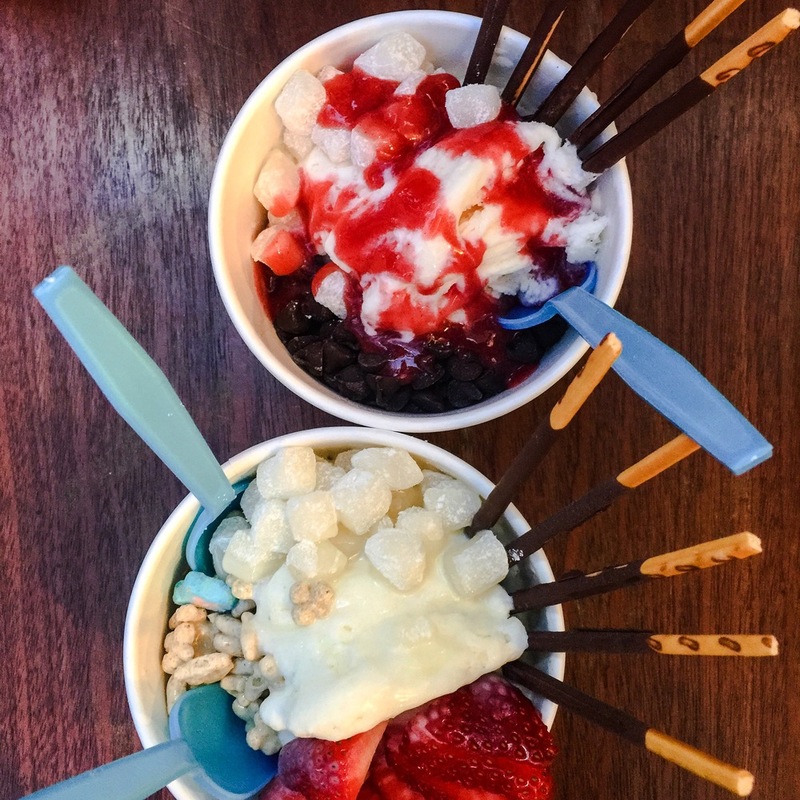 Asian and American sweets combine here at this St. Marks dessert spot thats perfect for a get together with friends. Its great because you can order a bunch of little desserts to share, no not share, its your prerogative. I went here alone so I selfishly got to eat everything myself. I loved the Golden Toast, The Harvest and the Green Tea Lava Cake. The Harvest below, comes out as the most adorable little potted plant. Almost too cute to eat. Almost. Beautifully displayed, delicious and excellent location. Whenever I can, I stop into this famous cookie bar, known for their cereal milk soft serve, crack pie and compost cookies. Sometimes I opt for the birthday cake truffles too. The crack pie slice is rich, delicious and I promise you won't be able to have just one bite. If you get the cereal milk soft serve ice cream, get additional cornflake crunch because the textures are absolutely amazing together! Momofuku even offers baking classes where you can learn to make some of their most popular items. You can find out more about their classes here! PS, I made the cake below! Korean bakery, Tous Les Jours, will enchant you with its beautifully displayed pastries, bread and treats right when you walk in. They have a seating area in the back that people can sit and enjoy their pastry or shaved ice. Tous Les Jours has several shaved ice with fruit toppings and jellies and the portions are quite large so remember to share! Let me know in the comments below if you have tried any of these places, love or hate them and if you know of more places for me to find a sugar rush!